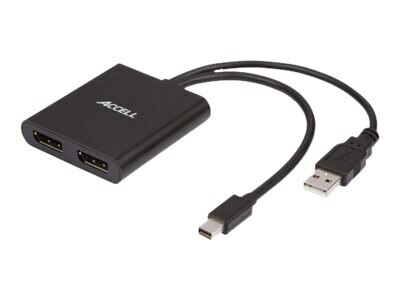 The Accell UltraAV DisplayPort 1.2 MST Multi-Display Hub allows you to enjoy up to 3 DisplayPort monitors from a single DisplayPort output. The hubs utilize the multi-stream transport (MST) protocol, supporting up to 3 displays independently at 2048 x 1536 @60Hz with DP 1.2 or 2560 x 1600 @60Hz (mirror mode) with DP 1.1 single-stream transport (SST). You can chose to view a single image across three displays, perfect for gaming, graphics design or spreadsheet analysis. Easily dedicate each display to a separate application, providing the efficiency and productivity of multi-tasking.